With winter coming to an end, we say hello to March! 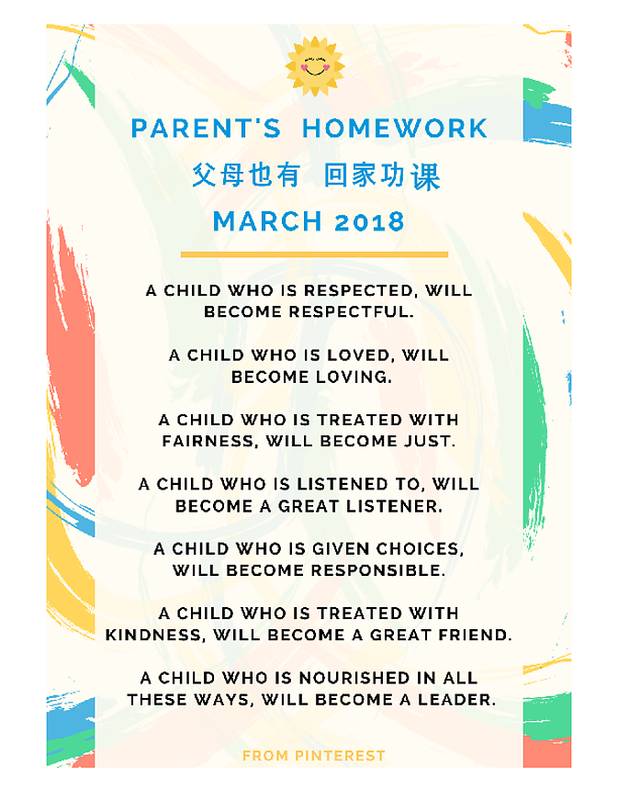 Below are a few Sunshine School reminders and announcements to keep in mind as we begin the month. 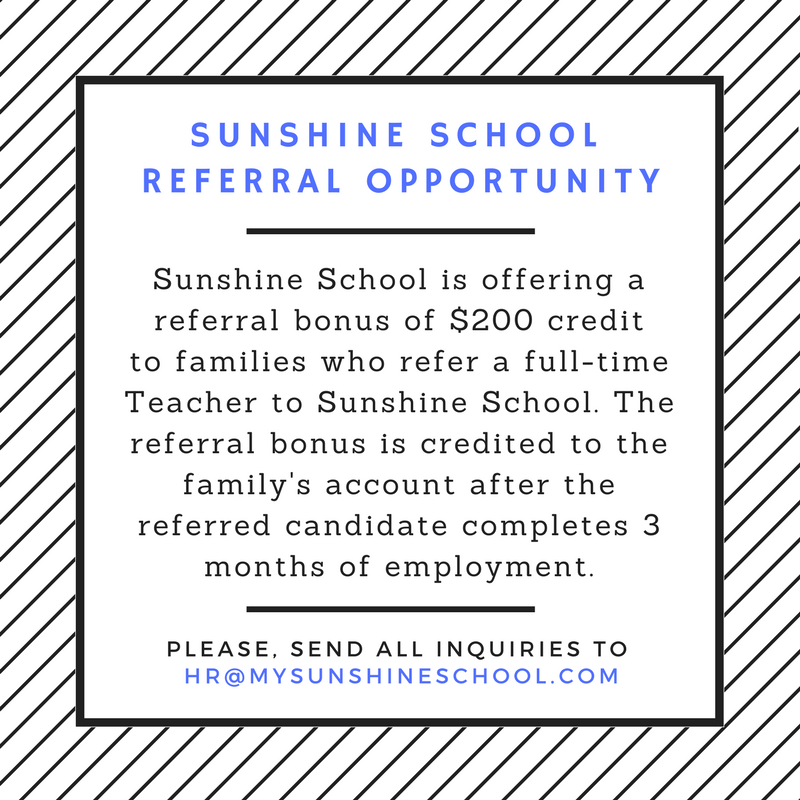 Thank you for staying updated with the Sunshine School Newsletter! Tuition is due by the 1st of every month. Parents may check their balance online at www.mysunshineschool.com. 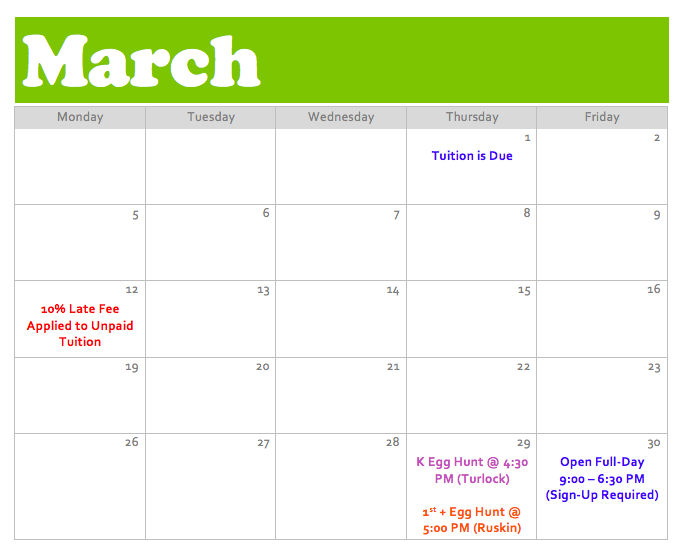 Please, pay the amount owed by March 10th or a late fee of 10% will apply. Thank you for your cooperation. 1st Graders and up will have their egg hunt on Thursday, March 29th at 5:00 PM on the Ruskin Field (1401 Turlock Lane). Students can bring a bucket or a basket for the egg hunt. Parents are invited to attend. Please, wear comfortable shoes and clothes. You may also bring a camera or camcorder to record your memories! Please, note that the Berryessa Unified School District has Spring Break from Friday, March 30th to Friday, April 6th. Sunshine School will be OPEN during these days from 9:00 AM - 6:30 PM as a full-day program. If you need daycare for these days, please sign up and pay to reserve your space! Sunshine Summer Program Information will be released on our website www.mysunshineschool.com on March 8th! Keep a look out for the exciting summer activities! Happy birthday to all our March babies. Wish your teachers a wonderful birthday when you see them this month!